River Cruise included with weekly rental (Except Holidays). Book a fishing charter or rent a small power boat on site(in season). Jet ski or small water craft has access to a deep water ramp. 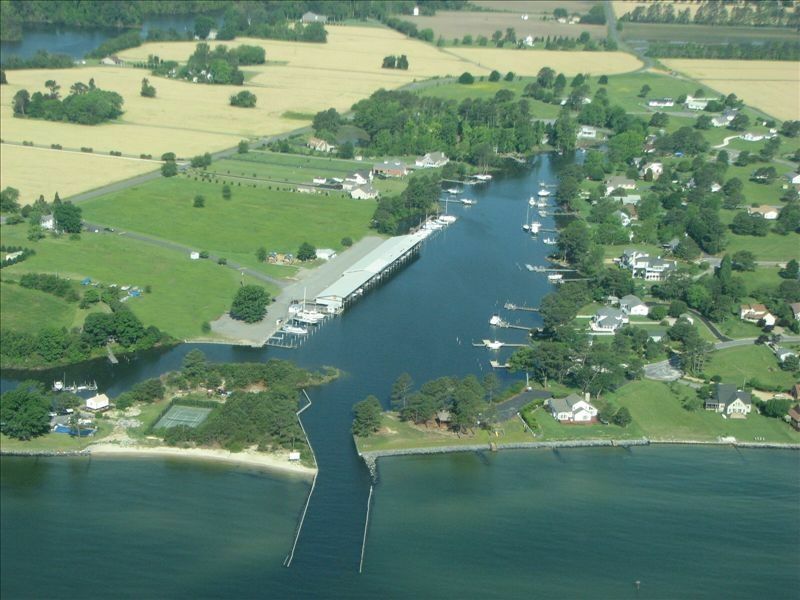 The Chesapeake Bay and the Inter-coastal Waterway puts you right on top of the best fishing and sailing in the region. Witness glorious sunrises and restful sunsets, sparkling fields of fireflies at twilight and the sound of the sea birds. Just relax and enjoy the peace and tranquility of an undiscovered corner of the world. We had so many inquiries about where to stay from our customers, we decided to have these lovely cottages built to meet the needs of our regular clientele. It was a greater need than we realized. In addition to fishing customers we now have families, honeymooners and regular folks like you and me longing for the Chesapeake Bay. They come for fun in the sun, fishing and water sports or just the peace and tranquility of being ….. on the Bay. This is the perfect place for the action packed vacation. Situated right on the Chesapeake Bay and the Inter-coastal Waterway puts you right on top of the best fishing and sailing in the region. Bring your jet ski, small water craft and use our deep water ramp. Book a fishing charter or dinner cruise (on site) to fine waterfront dining. Witness glorious sunrises and restful sunsets. Sparkling fields of fireflies at twilight. The sounds of the sea birds. Or just relax and enjoy the peace and tranquility of a lovely place not yet discovered by most of the world. Not a commercialized area but plenty of attractions nearby. Due to limited counter space, all our appliances are not displayed, but are available upon request. Canoe is complimentary for cabin guests. Kayaks available for rent. Ice, Powerboat and Kayak rentals, Complimentary use of canoe, Tackle shop, fishing dock, Crab pots available, Rod and reel rentals, volleyball net, sports equipment, Bath House with additional showers. Have booked this cabin before. It's perfect weekend fishing getaway, especially for trailered boats. I can launch, dock it (slip) all from right here. I'll be back. We just had an amazing time at Ingram Bay Marina. We rented one of the cabins which were so cozy, well equipped & clean! So very accommodating. Unfortunately, our boat experienced some mechanical issues so boating was cut short. But we so enjoyed the peace & quiet! We enjoyed visiting other nearby towns, and enjoyed some great seafood restaurants. We definitely will be back!!! Thank you again, and so glad we found you! This was perfect for us. I was able to launch my boat and had a slip close to the cabin. Fuel, ice, bait was all right there. Captain Billy is a Charter Boat Captain and the local expert. His advice was spot on. Everything we needed to Cook our catch, including grilling tools. Cabin was clean with Comfortable Beds and I was able to watch my game that night. Another day, we looked around the area and ate out at Crazy Crab and watched the sun set while we ate. This place is so close to the Bay, we were able to get a few more hours of fishing after checkout. So convenient. Next time we'll bring the kids and rent the 3 bedroom house. Thanks for showing it to us. A Great Getaway experience. It was an amazing stay. Thank you Mary for allowing us to stay in your cottage. I will definitely love to come back. There is plenty to do even though you have to drive at least 20 minutes to walmart, car wash cafe (great place to eat 😋�😋�), reedsville for tangiers island, which is great to go see. We canoed, and crabbed. Watch your step while crabbing because you'll end up like me trying to pull yourself outta the bay while in the middle of trying to crab. Fun times. It was a great experience and Mary and her son were great. I reccomend this spot right on the water for anyone who wants to find peace in the middle of nowhere with a sky full of bright stars at night and to wake up to nice beautiful sunny weather. Also, visit Vil mar beach, but put vil mar road on maps bc wont come up otherwise. Thank you Mary!!!! The Cottage was Great! Was very comfortable and perfect for my stay. Was very convenient for my stay and the water! Look forward to more stays! Owner was very helpful and nice. Perfect for a weekend get away, a nice break during the week and I plan on booking for a week too. Great little cottage! Sure beats a hotel room at the same price. Loved this little cottage. Had everything we needed! Beats a stuffy cheap hotel room at the same price. My daughter loved having the loft to herself. Very accommodating and attentive hosts. We WILL be staying hete again! A very pleasant couple and their daughter. They left the cabin so neat I could hardly tell they were there. Would love to have them back anytime. Remember a weekly rental comes with a voucher for a free river cruise. *** Cancellation Policy is 30 days Notice *** We will do our very best to reschedule to a date that is convenient to your schedule. If this is impossible, we will give a full refund provided we have 30 days notice. Peak Season for us is April 15 through December 31. Monthly rates are only available from Jan. 1 - April 30) - Off Season. There is a premium rate for holidays and events. Please contact for accurate pricing and information on minimum stays for holidays and events. Rates are subject to change until booking is confirmed.